What about a colour set for your British Battle of Britain aircraft? Check! - Sounds like Airbrushes.com and their new products for June!! These new sets of 3 will be released soon, arriving in late July/early August. You may pre-order yours now on-line, or by email, phone or fax. In the past couple of years various model companies have branched out into the diorama market and until now there have been no dedicated LifeColor paint sets to paint these dioramas. However that has now changed and in the first of two new Debris and Rubble sets, LifeColor have produced three colours to help paint these dioramas. Please note that cheaper versions of this spray booth may be the 3 metre-cubed-per-minute model. For only a little more cost, this 4 metre-cubed-per-minute extractor is 33.33% more powerful than the cheaper model. When you use an airbrush (or any form of paint spray) you atomise paint particles and vapour into the air. Whether you are using water-based paints or solvent-based paints, these should not end up in your lungs. Protect yourself by using a spray booth that will draw all the paint vapours and particles through a filter and then expel them outdoors. The flexi-duct outlet can be fixed to a standard domestic vent or simply placed through a partially open window or door for portability and convenience. 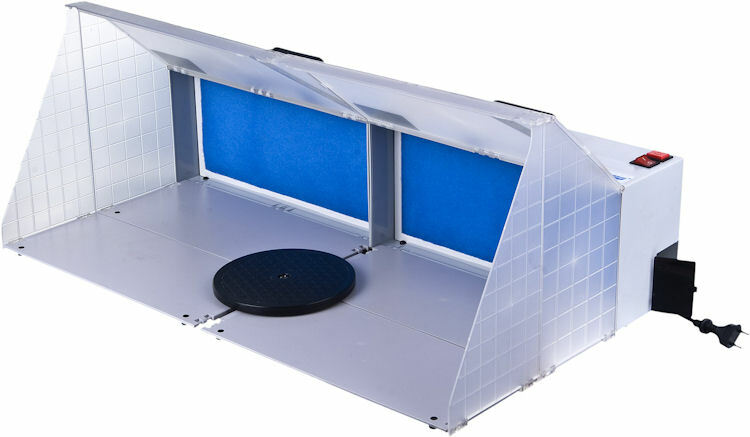 The E420DCK spray booth is light-weight and very easy to assemble (taking less than a minute), yet still very sturdy. The powerful fan system draws in overspray and vents the emission outside your work area. The booth includes a rotating turntable plate. The rotating turntable plate allows you to spray on all sides of the subject without touching the drying surface. 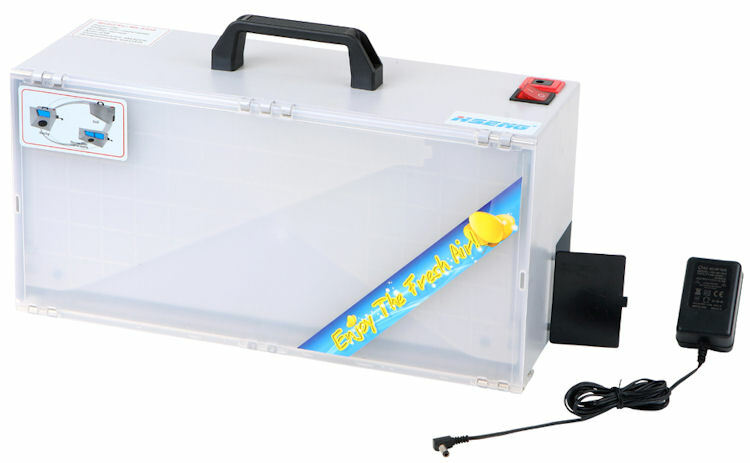 Perfect for airbrushing and decorating cakes or scale models. The turntable plate measures 190mm (7.5"). Not recommended for continual usage, i.e. production applications. 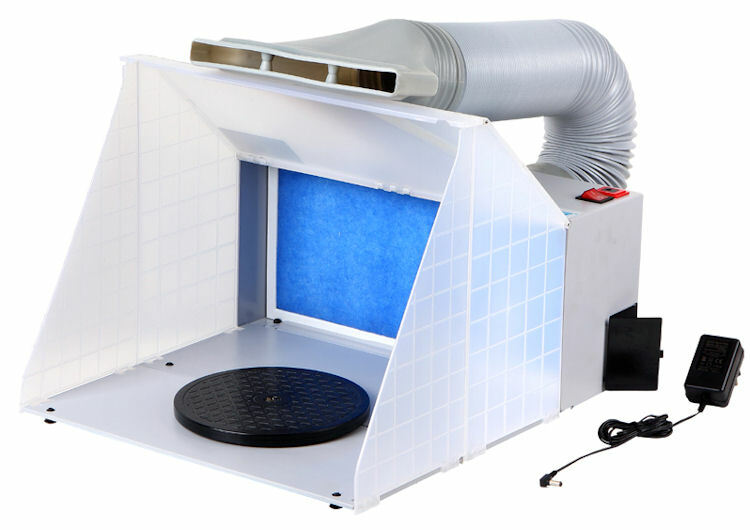 This spray booth is designed for studio/workshop cleanliness and to reduce concentrations of airborne contaminants. We recommend that you also wear a face mask or respirator to protect yourself from the overspray that is immediately around you before it gets extracted by the spray booth.